Hundreds of Iranian students supporting Iran’s post-revolutionary regime seized the U.S. embassy in Tehran, beginning a 444-day hostage crisis in Persian: تصرف سفارت آمریکا. 52 U.S. diplomats were held hostage from November 4, 1979 to January 20, 1981. In Iran, the incident was seen by many as a blow against the U.S and its long standing support of the autocratic Shah of Iran, Mohammad Reza Pahlavi. The Shah had been restored to power by a CIA-funded coup in 1953 and had recently been allowed into the United States for cancer treatment. In the United States, the hostage-taking was seen as an outrage violating a centuries-old principle of international law granting diplomats immunity from arrest and diplomatic compounds sovereignty in the territory of the host country they occupy. The U.S.’s 1953 coup of Iran’s democratically elected government had been conceived and executed from the U.S. embassy in Tehran. The ordeal reached a climax when after failed attempts to negotiate a release, the United States military attempted a rescue operation, Operation Eagle Claw, on April 24, 1980, which resulted in an aborted mission, the crash of two aircraft and the deaths of eight American military men. The crisis ended with the signing of the Algiers Accords in Algeria on January 19, 1981. 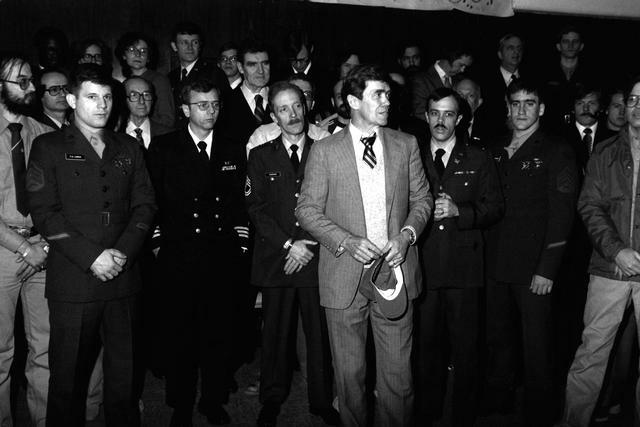 The hostages were formally released into United States custody the following day, just minutes after the new American president Ronald Reagan was sworn in. In America, the crisis is thought by some political analysts to be the primary reason for U.S. President Jimmy Carter’s defeat in the November 1980 presidential election. In Iran, it strengthened the prestige of the Ayatollah Khomeini and the political power of anti-American forces who supported the hostage taking. The crisis also marked the beginning of American legal action, or sanctions, that weakened economic ties between Iran and America. Sanctions blocked all property within U.S. jurisdiction owned by the Central Bank and Government of Iran.